Any air duct system should be dry and there should be no trace of moisture as this can cause a lot of damage to the ducts. Now the tricky bit is trying to keep the moisture out. Although it may sound like a big job, it is actually quite easy to keep moisture away, if we are just careful to note any possible leaks or cracks in the duct. Incorrect installation and servicing also contribute to moisture seeping into the ducts. In such cases mold tends to grow rapidly and cause havoc to the duct system. Here are a few ideas on how you can keep moisture away from the ducts. If a new HVAC unit is installed always use the right seal size because any mismatch will cause the unit to switch on and off more frequently to regulate temperature. 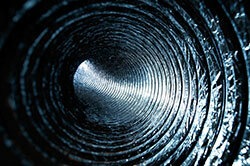 Always check the air ducts to see if condensation is causing any problems. The ducts should be properly sealed especially in areas where there is no air conditioning. The HVAC system should also be inspected and the insulation should be secure as condensation is another threat and causes moisture to seep in. Always ensure that the joints are sealed well as even a small amount of moisture can affect the functioning of the system. The job of cooling coils is to simply remove moisture from the air and another important component to check is the condensation pan. Ensure that the area around the cooling coils is never wet and water should never stagnate in the ductwork of the HVAC unit. These can be detected by simple visual inspection and any problem or leak should be fixed immediately. This is the only way to prevent moisture from entering the ducts.